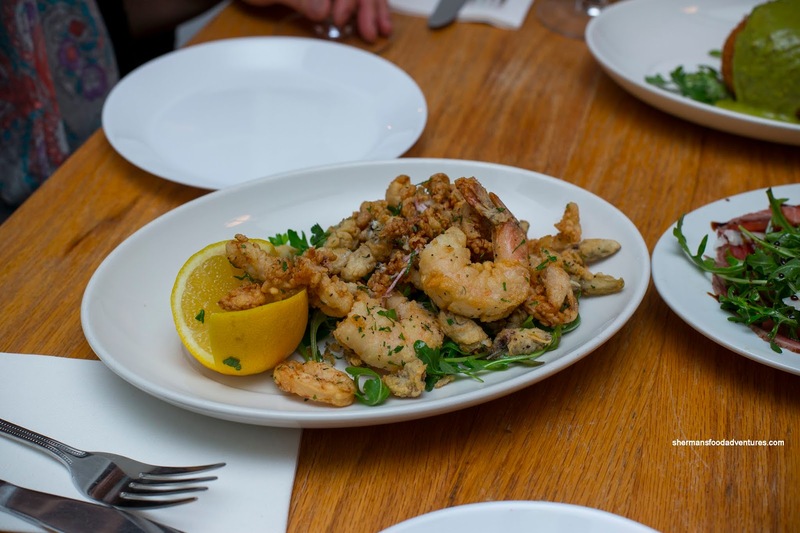 Before we got to that, we did the obligatory appies including the Fritto Misto di Pesce with deep fried calamari, whitebait and prawns. I found the batter to be light, not greasy and well-seasoned. There was much more whitebait (smelt) than anything else on the plate. It was flavourful and tender. The 2 large prawns were meaty with a moist snap. For some reason, we didn't get much calamari though. As much as it can be a small detail, the large lemon wedge was welcomed as we got plenty of tangy acidity. 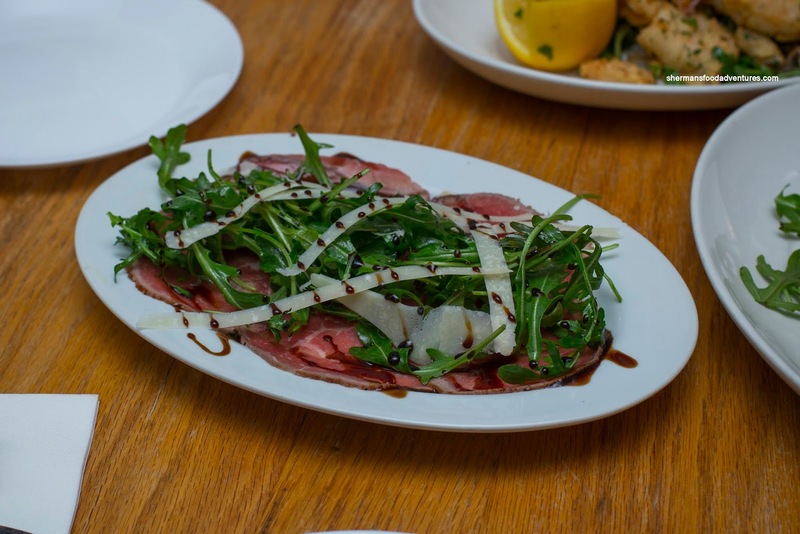 Dressed with arugula, parmesan and balsamic reduction, the Carpaccio di Manzo was actually sliced quite thick. As such, the texture and flavour was much meatier and robust. That didn't mean it wasn't tender though as it certainly was, but with just a tad more chew. 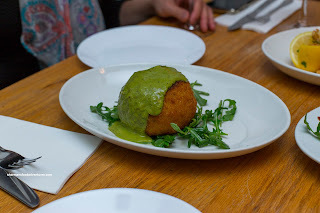 Continuing on, we were served a really big Arancina Bomba consisting of saffron rice, mozzarella and pistachio pesto. At first, I was concerned that the temperature might be compromised due to its size, but that was unfounded. Beyond the crispy golden exterior, the arancina was evenly hot throughout. The rice was tender while retaining a slight chewiness. It was certainly cheesy and aromatic as well. 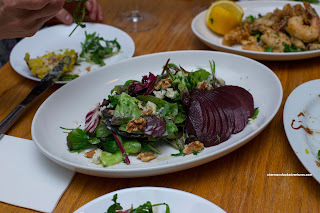 Trying to hit all the sections of the menu, we also got a salad in the Poached Pear, Gorgonzola and Walnut. This was not a complex salad as all of the ingredients were present and did their part. The crisp greens were lightly dressed and benefited from the sharp cheese and mildly sweet pear. Of course the walnut added the necessary crunch and nuttiness. 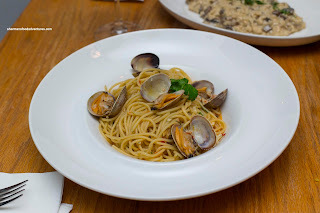 Onto the pastas, we ordered my favourite in the Spaghetti alle Vongole sporting fresh clams and also more clams hidden underneath. I thought the pasta was perfectly al dente with an appealing chew. The addition of chili afforded a balanced spice while the garlic did its aromatic thing. We thought that even more clam brininess would've kick this up a notch, but that was nit-picking as we enjoyed this pasta very much. Packed with guanciale, the Spaghetti alla Carbonara was rich and creamy. I'm glad I got to it when it was still steaming hot. 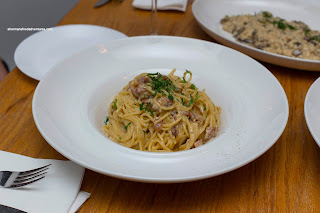 At that stage, the pasta was appealingly chewy while cheesy and purposefully salty. Later when it cooked, it naturally got clumpy. Make sure you eat it right away! 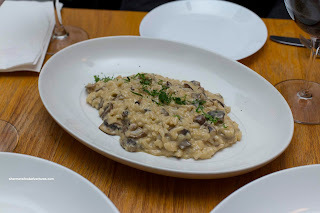 Staying with the theme of "trying something from each section", we got the Risotto Funghi Porcini. OMG, this was absolutely delicious. They did not skimp on the marscapone as the risotto was cheesy and rich. Little bursts of woodsiness were thanks to the generous amount of porcini mushrooms. Best of all, the arborio was not overcooked, yet at the same time was tender. A very well-executed risotto and yes, best eaten right away too! For our pizza selection, we tried the Salsciccia and Rapini with mozzarella and tomato sauce. As shown in the picture, the crust was nicely charred which meant it was nutty and crunchy. 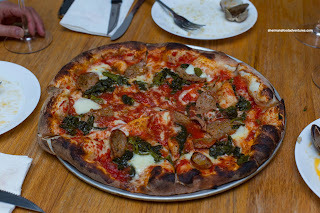 I found the middle of the pizza a bit squishy, but that was due mostly to the wet ingredients including the sauce and rapini. I thought the tomato sauce was excellent being tangy and full-bodied. There was ample tender sausage on top for impact. 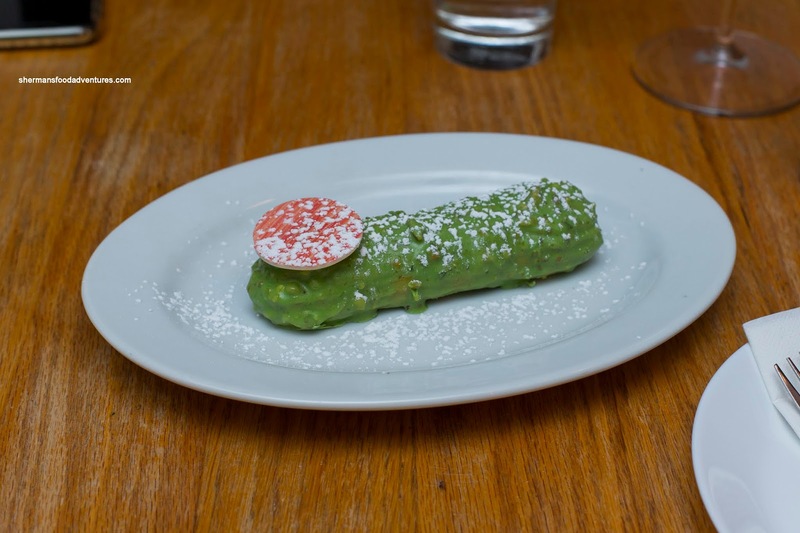 We weren't planning on ordering dessert, but they offered us up the Eclaire al Pistacchio since the pizza took so long. Nice gesture. At first, one would assume the pistacchio glaze on the outside was basically it, yet on the inside, there was a tart and tangy berry filling to go with the nutty sweetness. All-in-all, a very pleasant experience at Mangia that could be repeated many times due to the reasonable pricing. 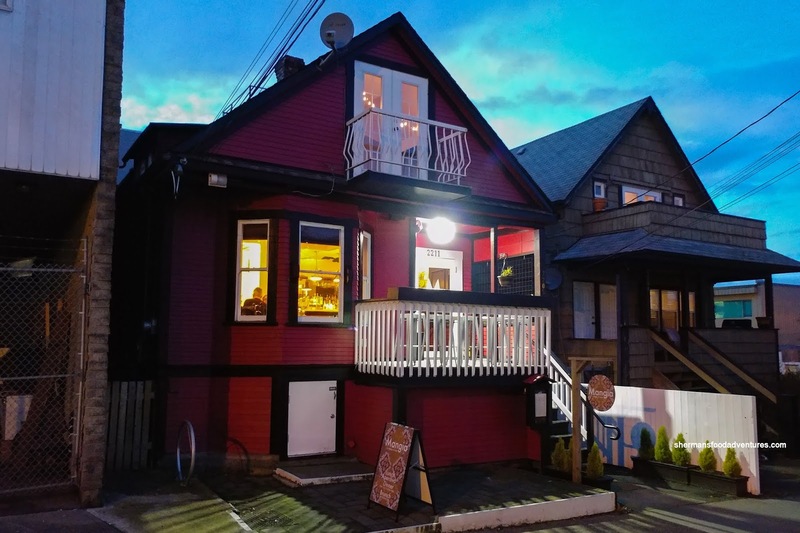 Of course there is fancier, more elevated Italian restaurants out there, but if you were looking solely at the food in a quaint little space, Mangia is a great choice.